Photodynamic therapy (PDT), as a noninvasive therapeutic method, has been actively explored recently for cancer treatment. However, owing to the weak absorption in the optically transparent windows of biological tissues, most commercial photosensitizers (PSs) exhibit low singlet oxygen (1O2) quantum yields when excited by light within this window. Finding the best way to boost 1O2 production for clinical applications using light sources within this window is, thus, a great challenge. Herein, we tackle this problem using plasmon resonance energy transfer (PRET) from plasmonic nanoparticles (NPs) to PSs and demonstrate that the formation of plasmon quenching dips is an effective way to enhance 1O2 generation. The combination of the photosensitizer chlorin e6 (Ce6) and gold nanorods (AuNR) was employed as a model system. We observed a clear quenching dip in the longitudinal surface plasmon resonance (LSPR) band of the AuNRs when the LSPR band overlaps with the Q band of Ce6 and the spacing between Ce6 and the rods is within the acting distance of PRET. Upon irradiation with 660 nm continuous-wave laser light, we obtained a seven-fold enhancement in the 1O2 signal intensity compared with that of a non-PRET sample, as determined using the 1O2 electron spin resonance probe 2,2,6,6-tetramethyl-4-piperidine (TEMP). Furthermore, we demonstrated that the PRET effect is more efficient in enhancing 1O2 yield than the often-employed local field enhancement effect. The effectiveness of PRET is further extended to the in vitro level. 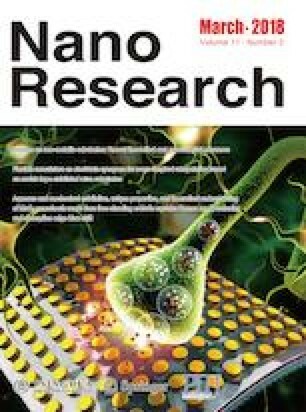 Considering the flexibility in manipulating the localized SPR properties of plasmonic nanoparticles/nanostructures, our findings suggest that PRET-based strategies may be a general way to overcome the deficiency of most commercial organic PSs in biological optically transparent windows and promote their applications in clinical tumor treatments. Supplementary material (TEM characterizations of AuNRs, effects of surface coating molecules on the absorbance and fluorescence of Ce6, FDTD simulations of AuNR and Ce6 hybrids, NaA oxidation under different conditions, preparation of mesoporous silica-coated AuNRs and their interactions with Ce6) is available in the online version of this article at https://doi.org/10.1007/s12274-017-1762-5. This work was supported by the Ministry of Science and Technology of China (Nos. 2016YFA0200903 and 2011CB932802), and the National Natural Science Foundation of China (Nos. 91127013 and 21173056).